Now don't be scared, its only a picture of a spider and its web, or is it? 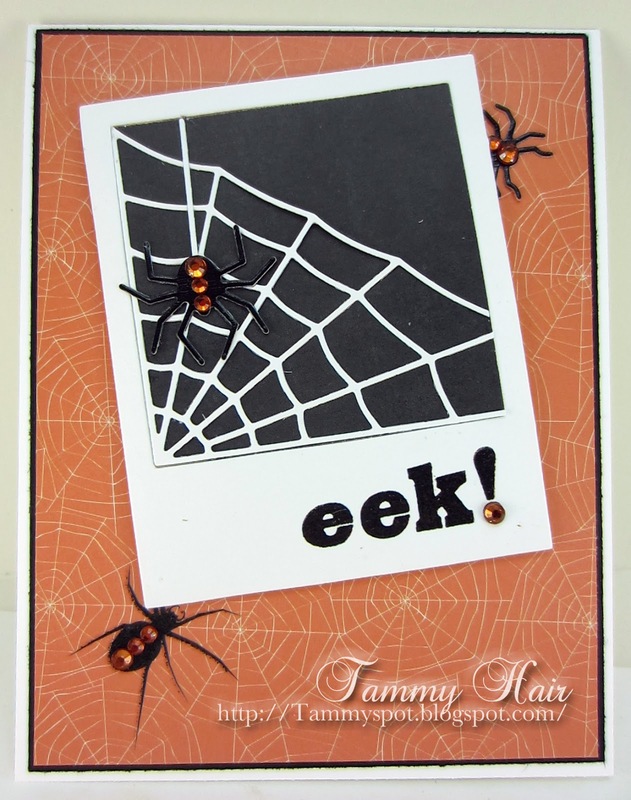 This is fabulous Tammy, I love those spiders! This is too cute and so clever! Eek is right! Those spiders look real! Love the card and all the fun spider webs. Love it, as always Tammy, you've nailed it! Eeek..someone took the lid off the jar...Fabulous Tammy.. But I'll tell you what, that card is AWESOME!!! Great job on the creepy and groovy combination! Really awesome Halloween design!! Love the framed spider web with the spider and sequin accents!! So fun!! :) And spiders really creep me out!! LOL! I am loving these jeweled spiders and their die cut web! Sensational background paper, too, Tammy! Ooooh, but they're so pretty with their jewels! Very cool! awesome jeweled spiders. fun card.